Little by little, Apple is upgrading the online iCloud portal to bring its features up to speed with comparable services like Google Drive or Dropbox. Its file recovery powers recently got a boost, with added options to restore contacts and calendars. Here’s how to find the settings you need. Log into iCloud.com and you might find the interface looks somewhat busier and more comprehensive than last time you visited. 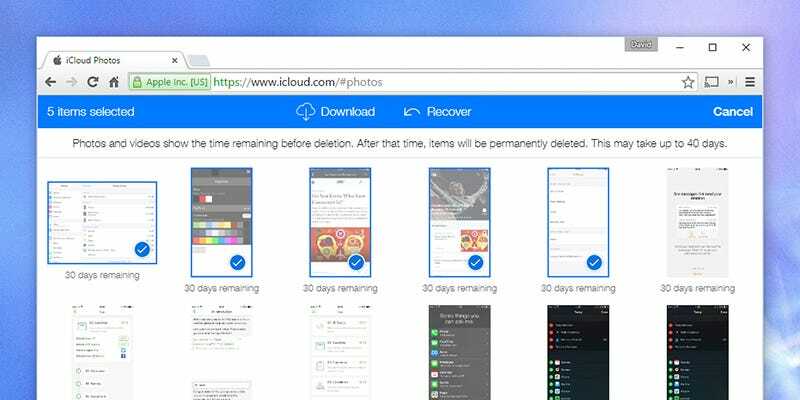 If recently deleted pictures are what you need to retrieve, click Photos, then open the Albums page and select the Recently deleted folder—click Select Photos, pick out your pictures, then choose Recover. The same folder can be found on your connected iOS and OS X devices too, depending on where you erased the original images from. New to iCloud.com is the ability to bring back contacts and calendars you’ve erased; the option for recovering files (which was previously pretty difficult to find) has been moved at the same time. To find these tools, open the Settings app on the web portal, and the links you need are in the lower left-hand corner (under the Advanced heading). Choose from files, contacts and calendars, pick the data you want to restore, and it returns back to its original spot on your devices and computers—the restoration process will save your current configuration as an archive of its own, so you can quickly switch back to it if necessary.